Let me introduce you to the first project in Beginner’s Guide to Making Skirts – the Roewood, a jersey pencil skirt. It’s called the Roewood after one of my first schools in Sheffield. We didn’t actually do a lot of sewing in that school, but it was around the time that I started making clothes at home on an old Singer hand crank sewing machine. It was the 80s and my dressmaking of choice was simple batwing tops in an array of lurid coloured cheap cotton from the local market. After the first few I started adding bow ties to them in matching fabric. Thankfully I have no photographic evidence of these creations!! The Roewood is a great introduction to working with stretch fabrics and an ideal project for beginners as it’s easy to fit and quick and easy to make. If you already know me and my work you’ll know what a fan I am of working with knitted fabrics so won’t be surprised that this is the first skirt in the book. This skirt has an elasticated waist and you can progress from making the simplest plain version in any length then move onto some simple colour blocking and fabric mixing and then adding a flattering ruched detail to the side seams. The Roewood skirt works in a wide range of knitted fabrics from single jersey to ponte roma, but you could also try it in a loopback sweatshirt (or French terry) for a casual sporty skirt, or a cut & sew knit (or sweater knit) for a snuggly winter maxi skirt in the longer length. If it’s your first time with knits choose ponte roma; it’s great fabric to wear and easy to work with. Watch out for skirt number 2 tomorrow! Good news, my stock of the book has now arrived and I’m taking pre-orders for signed copies! You can order yours here. NOTE: You will be charged when you place your order, but your book won’t be sent until publication day on 25th October. Want to spend a day making a Roewood skirt with me at MIY Workshop in Brighton? There are still places available at the class on Sunday 6th November, full details and how to book here. 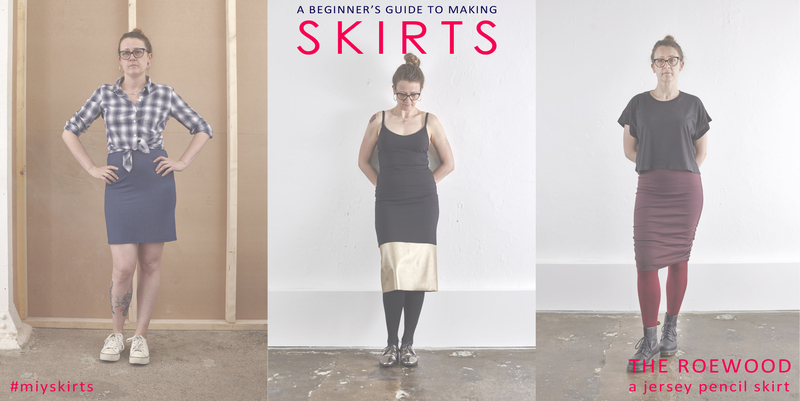 This entry was posted in Beginner's Guide to Making Skirts, Books by Wendy and tagged Beginner's Guide to Making Skirts, beginners guide to skirts, Cico books, easy skirt pattern, how to make a skirt, how to sew, jersey pencil skirt, julian ward, learn to sew, miy skirts, roewood skirt, Sewing With Knits, skirt patterns, Wendy Ward. Bookmark the permalink.